Wolf Creek Ranch is a community with no equals in the Park City area. Located less than 25 miles from Park City, Utah Wolf Creek ranch is a master planned gated community of just 84 homes on 14,000 acres (nearly 21 square miles). The area is situated on a high alpine plateau with seemingly endless views in all directions. Twelve of Wolf Creek Ranch's lots back to the 2.2 million acre Uinta National Forest (5 ranch trails give owners access to the area). Empty spaces between you and your neighbors are filled with native aspens, pines, indigenous plants and wildlife. Homesites within Wolf Creek Ranch are accessed via the 27 miles of paved roads which are open and maintained year around. The area feels as though you are living in a National Park. Lots within Wolf Creek are 160 acres each (for a square lot that is ½ mile by ½ mile). The infrastructure within Wolf Creek Ranch is complete and includes power and fiber optics to the lots and a private water distribution system. Each home site has approximately a 10 acre building envelope which may contain a main house, guest house and barn. 95% of Wolf Creek Ranch has been places under a conservation easement and will remain undeveloped. The Wolf Creek Ranch community features over 50 miles of trails that are great for walking, biking, hiking, ATV and horseback riding in the summer; skiing, snowshoeing and snowmobiling during the winter. Fishermen will enjoy the stocked ponds and the fly fishing along the private mile on the Provo River. The 26 acre equestrian center offers a 28-stall stable with tack room, a hay storage barn, an equipment barn, and an outdoor riding area (this facility is currently operated by a local outfitter). Additionally, owners have access to a 4 bedroom guest home, an owner Lodge Barn and 4 private yurts within the Ranch. Wolf Creek Ranch has an onsite Ranch Manager, concierge service and guard and maintenance personnel. 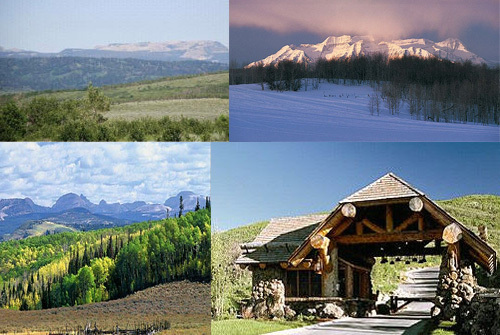 Wolf Creek Ranch seems truly a world away and offers peace and solitude no city or resort can equal. Yet this mountain paradise is only minutes from the ski destination resorts of Park City, UT and less than 6 miles from the center of Heber, Utah.